This article is about the sample course in Super Mario Maker. For the sound effects used in the game, see Soundfrog § List of sound effects. 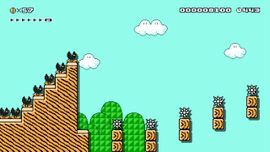 Sound Effects is the sixth sample course in Super Mario Maker, unlocked as the player receives new course sets and sound effects. It is set in the Super Mario Bros. 3 style, and is in the ground theme. The player starts off in an area with Brick Blocks, along with a ? Block. The ? Blocks contains a Super Mushroom. They will then find two Mushroom Platforms, one of which has a Wiggler on it. After the Mushroom Platforms, they will find a Shoe Goomba and some Brick Blocks above Munchers. After the Munchers, Spike Traps that must be jumped across using the Goomba's Shoe, along with a Koopa Clown Car, can be found. The player must use the Koopa Clown Car to follow a trail of Coins, which will lead to the Goal. Various objects and enemies in the level play sound effects when interacted with. This page was last edited on June 29, 2017, at 05:12.